The software includes two programs that are simple to use, yet giving the most demonstrative results, showing every cell in the crypt of intestinal epithelium. 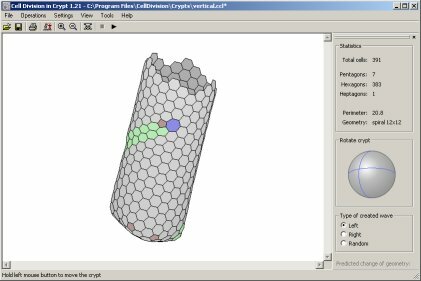 The main program, Cell Division in Crypt, performs computer simulation of the processes of cell proliferation, cell movement and growth in the crypt in accordance with the spatial/topological requirements for cell division in this particular tissue, as outlined in our Main page. The accessory program, Crypt Builder, allows to build an initial crypt configuration. It also allows to construct other tissue models with different structures and cell arrangements and then to test their proliferative capabilities in the main program. The modeling of tissues presenting a particular interest for individual researchers is possible, as long as the structure remains essentially two-dimensional. However, folding the two-dimensional structures, as we believe, can generate models of the real tissues which, possibly, are just this - a folded sheet of connected cells. The functioning of both programs is described in Program Help. Supported operating systems are Windows 98/ME/2000/XP. 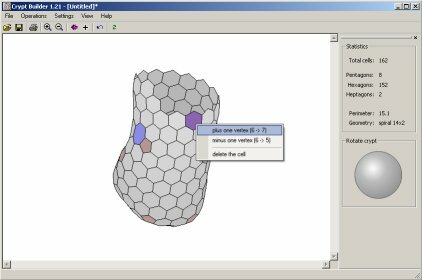 We believe that this program can serve as an excellent tool for classroom demonstration in Cell Biology.